Want to add some excitement and personality to your garden this summer? Plant elephant ears! These tropical plants can grow up to 6 feet tall, with leaves as long as your arm. Elephant ears have always been popular in Florida and other parts of the deep south, but these days they’re being grown nearly everywhere in the country – even in northern states. Pete Langeveld, one of the co-owners of Longfield Gardens, is a huge fan of elephant ears and he grows lots of them in his New Jersey garden. I asked him to share some tips about how he keeps his plants happy. Pete says it’s important to know what kind of elephant ears you’re growing. 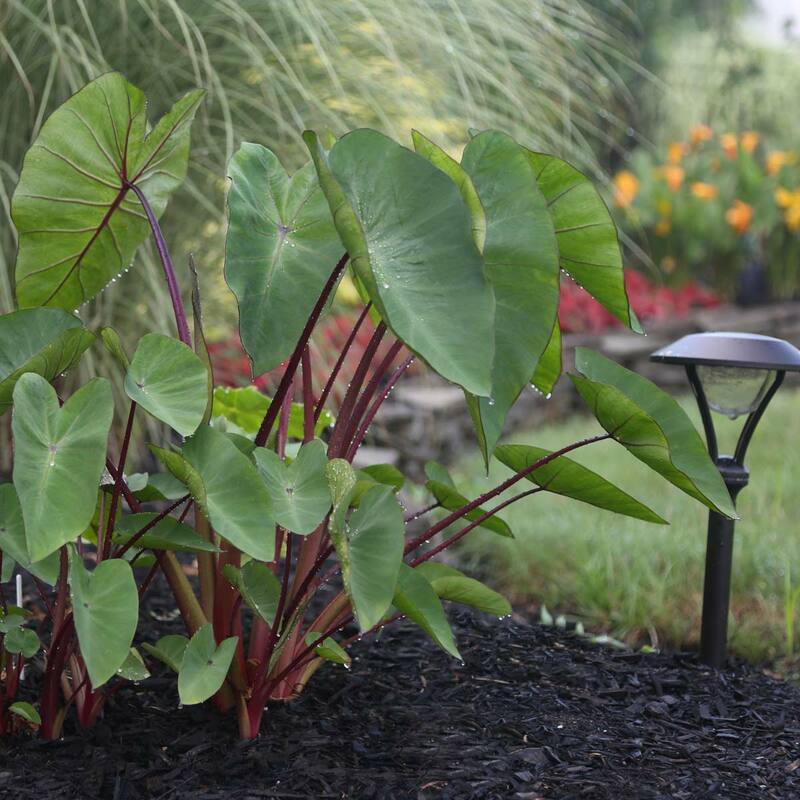 The common name “elephant ears” covers two different plant species. Alocasias have glossy, heart-shaped leaves that may be solid green or decorated with light or dark patterns. You can recognize them by the way the leaves are displayed: the bottom tip of the heart either points out, perpendicular to the stem or is held straight up to the sky. Alocasias such as Odora, prefer partial shade and though they need to be watered regularly, they should always be grown in well-drained soil. Colocasias display their leaves with the tip of the heart pointing downward. These are moisture-loving plants and it’s almost impossible to overwater them. Though colocasias such as Black Stem will grow in part shade, they need full sun to reach their maximum size. There’s another other significant difference between these two types of elephant ears. Alocasias don’t shed their leaves in the winter. So if you live in zones 4-8, where the plants are not hardy, you can simply grow them indoors as houseplants during the winter months. Pete has a big Alocasia ‘Odora’ in his office and said this is the fourth time he’s brought it in for the winter. Colocasia, on the other hand, are deciduous. This means they shed their leaves in the winter – even in tropical climates. In growing zones 9-11, the plants can be left right in the garden. In colder areas, you will need to dig up the tubers and store them indoors (or plant new tubers next spring). Most elephant ears are native to tropical regions: the Amazon Basin, Central Africa or Southeast Asia. The air in these climates is hot and steamy, and soil temperatures rarely fall below 80°F. Though you may not be able to replicate these ideal growing conditions, you can give your elephant ears a warm, sheltered spot where they are protected from drying winds. 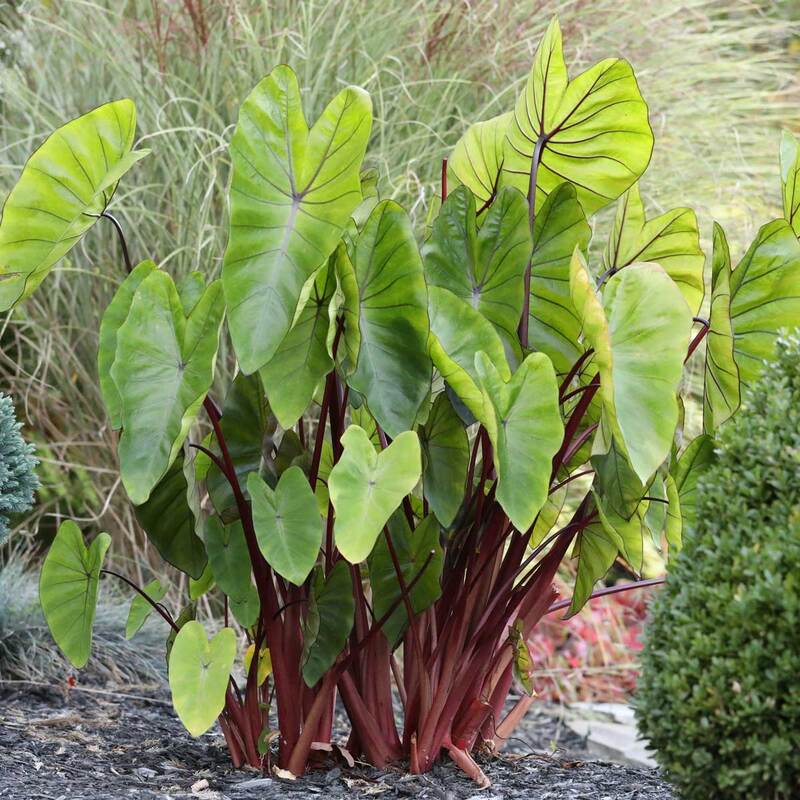 South-central New Jersey is in hardiness zone 7 and Pete has great success growing elephant ears in the garden as well as in planters — though he says the ones in planters usually grow twice as large. The key is to WAIT and not plant the tubers too early. 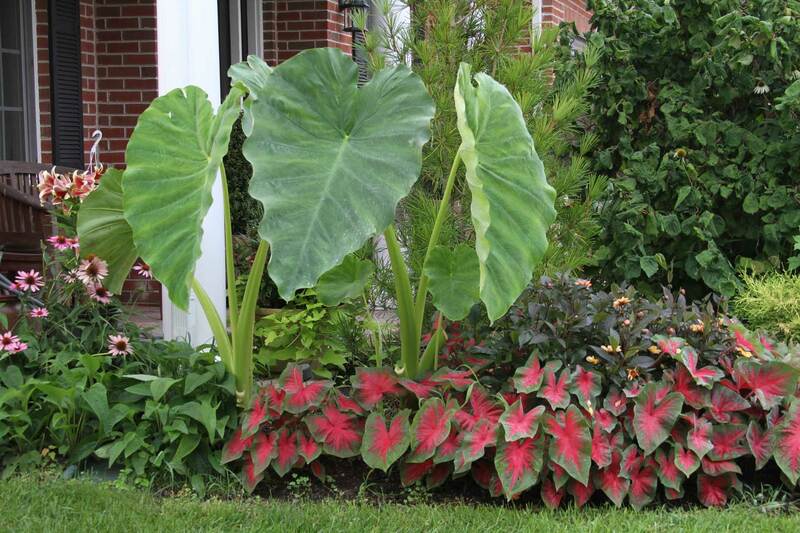 In the central U.S., elephant ears should not be planted outdoors until after Memorial Day. In northern areas, it’s best to wait until mid-June. If you grow caladiums, plant your elephant ears on the same schedule. Last year, one of Pete’s elephant ears (Colocasia esculenta) grew almost 8 feet tall. The secret? He planted it beside his outdoor faucet! Colocasias have an insatiable thirst and the more water they get, the bigger they grow. 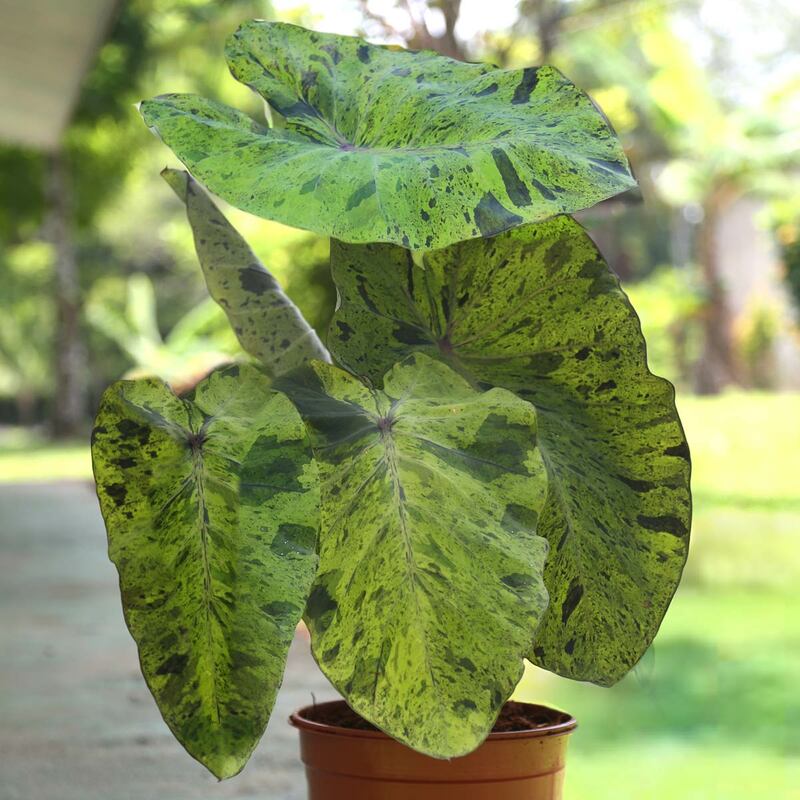 With the growing interest in elephant ears, plant breeders have been introducing some exciting new varieties. When selecting plants for your garden, pay attention to the description. While some elephant ears, such as Colocasia esculenta can reach 7 feet tall, others top out at 2 or 3 feet. In addition to height, elephant ears also have different growth habits. Some, like Black Magic, send up a small number of tall, primary stems with big leaves. Others, such as Hawaiian Punch, have smaller leaves, but still, have a big presence because they produce a large clump with lots of stems. Deer are a big problem in Pete’s neighborhood, but they don’t seem to pay any attention to elephant ears. 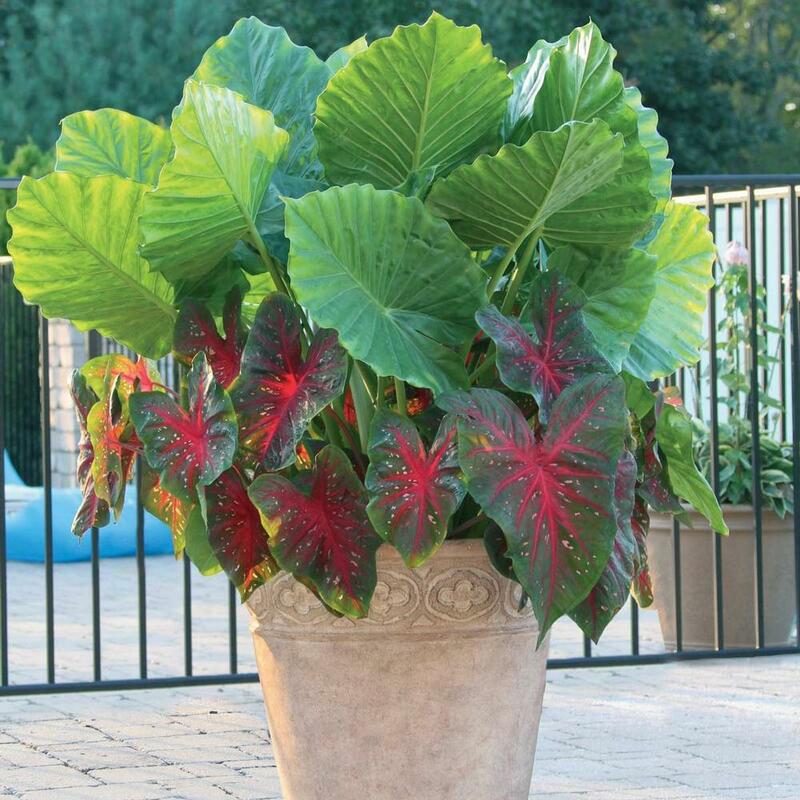 He finds this to hold true for caladiums as well, so he often plants the two together. Elephant ears a getting more popular every year. Increasing demand is a good incentive for plant breeders, and they’re introducing lots of interesting new varieties.